While other speakers in the Innovation Series address rocket science, defense, the environment and building community, one speaker chose a completely different topic – the perfect plate of hummus. 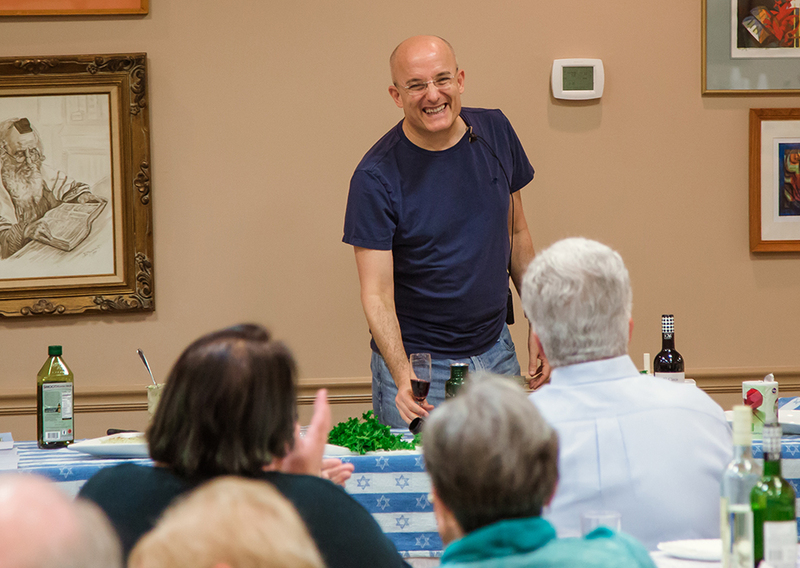 Gil Hovav, an author and culinary journalist, was the second speaker in the series this month. He spoke October 1, at The Temple, where he reflected on his great-grandfather, Eliezer Ben-Yehuda, the architect of the modern Hebrew language, and the resistance he faced, especially among ultra-Orthodox Jews, to reviving Hebrew as a spoken language. But on October 2, at Temple Shalom, he demonstrated how to make hummus. The pasty dip made from chickpeas doesn’t look so appetizing, Hovav admitted, but it is arguably the national food of Israel, and a dish with a long history. In fact, Hovav maintains it is mentioned in the Book of Ruth. In modern times, hummus has been caught up in the Arab-Israeli conflict. Lebanon actually sued Israel in the International Court at the Hague, claiming it had invented the dish and Israel had usurped the name. Turning to the demonstration, Hovav offered tips for making hummus “like a real Jerusalemite. For one, don’t skimp on the tahini – the base ingredient. He also said to zest the entire lemon peel – yellow and white. And add the water used to cook the chickpeas, which Hovav said is full of protein. To this day, Hovav said, his family graves on the Mount of Olives in Jerusalem are desecrated by the Neturei Karta,a group of extremist Orthodox Jews, who object to Ben Yehuda’s revival of a language they believe should only be used for liturgical purposes. But Ben-Yehuda, a lexicographer, newspaper editor and Zionist who immigrated to Israel from tsarist Russia in 1881, had other plans. He wanted to develop a language to replace Yiddish, which could be spoken by Jews already living in the land and for those who would soon make aliyah. But Jews who lived in Palestine, which was ruled by the Ottoman Empire at the time, were not Zionists, made Hebrew a tough sell.